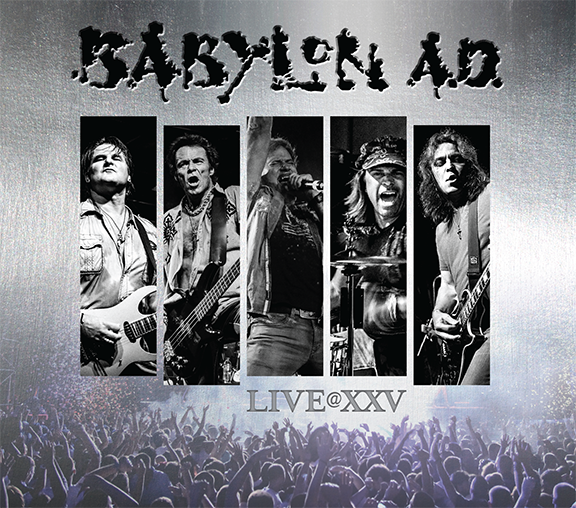 Babylon A.D. releases new live album “Live@XXV” - Babylon A.D. The new CD is being released in celebration of the 25th anniversary of the band’s first release, “Babylon A.D.,” on Arista Records. Songs from all of their previous releases with Arista and Apocalypse Records are represented. The album includes their top-ten rock-radio classic hits “Hammer Swings Down,” “Bang Go The Bells,” “Kid Goes Wild,” and “Bad Blood,” along with standouts “Shot of Love,” “Desperate,” “Sinking In The Sand,” and an angst-driven rendition of Montrose’s “Rock The Nation.” The thirteen hard-rocking tracks on “Live@XXV” showcase the high-energy, powerful live performances that Babylon A.D. is renowned for. “Live@XXV” follows the 2014 release of the four-song E.P. “Lost Sessions/Fresno, CA 93.” 2014 also saw the band play several concert festival dates including, FIREFEST “The Final Fling” Rock Festival in Nottingham, U.K. and “Rock N’ Skull 2014” in Chicago, along with several other high-profile shows across the U.S. In 2015, Babylon A.D. is once again on the move with upcoming record release parties in Salt Lake City on March 20 and Las Vegas on March 21. B.A.D. have also been invited to play the very prestigious Monsters of Rock Cruise. The MORC, held April 18-22 in Nassau, The Bahamas, will feature San Francisco Bay Area favorites Y&T, Night Ranger and Tesla, along with many of the biggest bands of the late 80s and early 90s hard-rock Hair Nation genre. Babylon A.D. will be bringing their dynamic live show to a city near you! This is the best live cd I have EVER heard. The Energy level from the opening track all the way through is simply, awesome. The songs, some of which are 25 years or older still sound fresh and crisp. This is no ordinary rock band here, these are musicians that are at the highest standard.